Life Systems Design :: ErgoOne Single Channel Pipette Starter Pack, Set of 4, plus free gifts. 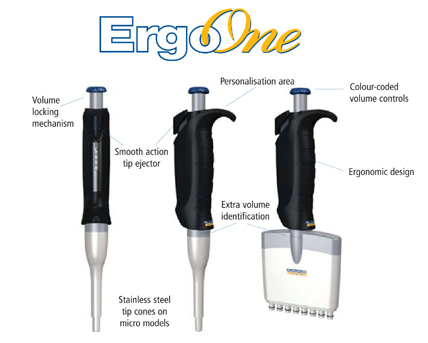 ErgoOne Single Channel Pipette Starter Pack, Set of 4, plus free gifts. Everyday, pipettes are confronted with multiple tasks that must be exact and precise. Reliability is key in the laboratory and your pipette must be trusted to perform well, day in, day out. ErgoOne™ offers accuracy and precision you can trust, with a stylish new look you will love. More Information ErgoOne Single Channel Pipette Starter Pack contains of 4 pipettes (10 / 20 / 200 and 1000ul), 4 units of TipOne tips in racks, 4 self adhesive single pipette holders and and 2 Starlab Thermo Glass.